Today began with a buffet breakfast (they had Nutella in packets!!! Amazing), followed by our first formal wine tasting. 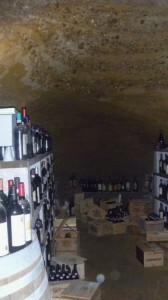 Before the actual tasting began, we got a private tour of the wine cellars at Enoteca Italiana. This cellar is nothing like the stereotypical dark, dank, dusty, wine cellar I anticipated. Instead, the more than 1,700 wines were elegantly displayed throughout the vast, impeccably organized space. 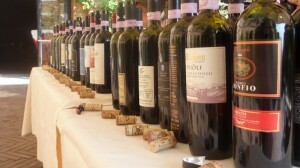 Check out this video: Wine Cellar Tour. Technology also plays an important role in this cellar. Each bottle of wine that is displayed also has an accompanying bar code that will give you further details when scanned (much like the devices used in museums to tell you more about indivdual paintings. 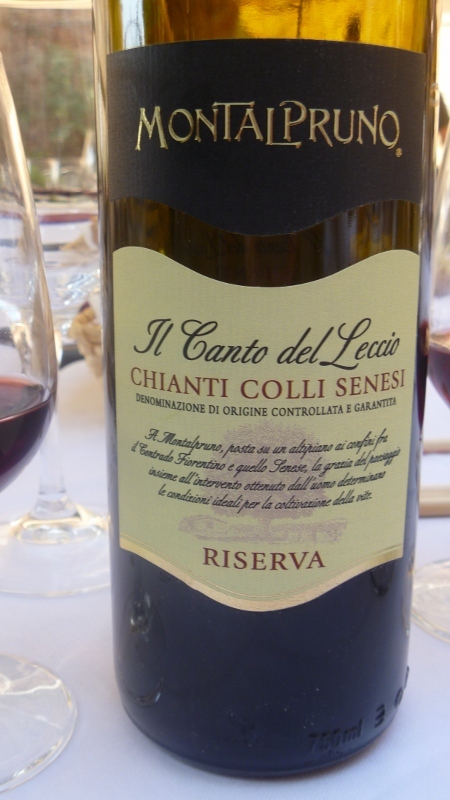 Once the short tour was over, the official tasting of Chianti Colli Senesi wines began. Chianti Colli Senesi is a specific geographical area within the Chianti region. it is situated entirely in the province of Siena and makes up approximately 2,000 acres. .
Chianti Colli Senesi is a red wine comprised of at least 75% Sangiovese. 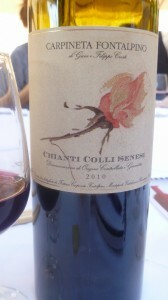 For the remaining percentage, approved varieties of red grapes can be used, such as black Canaiolo, Colorino and Cillegiolo. 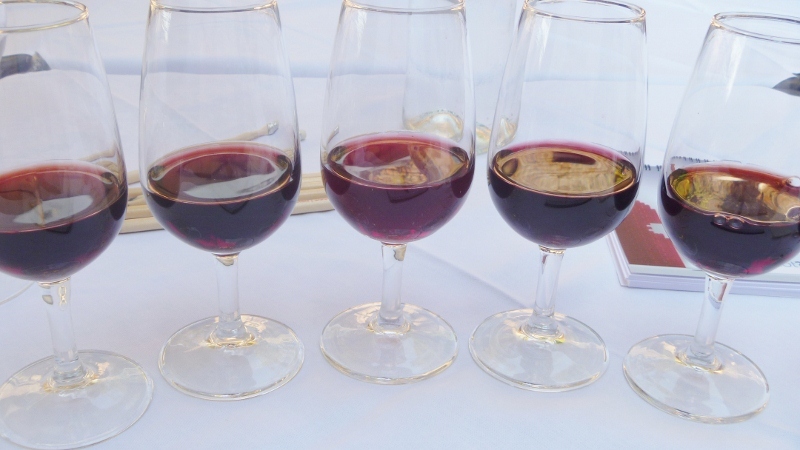 We were also told that some wine producers add a few white varieties of grapes to help make the wine more drinkable sooner and to help the color. The best tip I learned today is that as red wines age, they lose color. So, the next time you open a bottle of red, and you want to impress your friends, take a look at the color of the ring at the top of the glass. The lighter it is, the older it is. 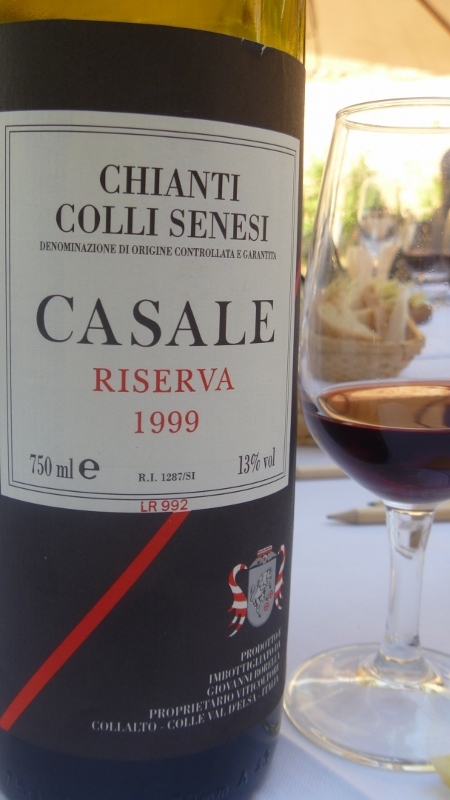 Casale Risvera (1999): The nose for this wine is earthy and rustic, with hints of sage and mint. Though complex, this was one of the lightest wines of the day (and one of my favorites) with flavors of orange peel and red berries. Montalpruno Il Cante del Leccio (2007) The next wine smelled like fields of strawberries, and tasted like strawberry and mango jam. I loved the fruit-forward flavors and know I could drink this one all day. 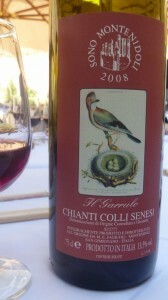 Sono Montenidoli Il Garule (2008): The third wine was brighter in color and more aggressive than the first two selections. It also had a strong mineral quality and a lot of acidity that packed a punch and left me salivating for several minutes after tasting. 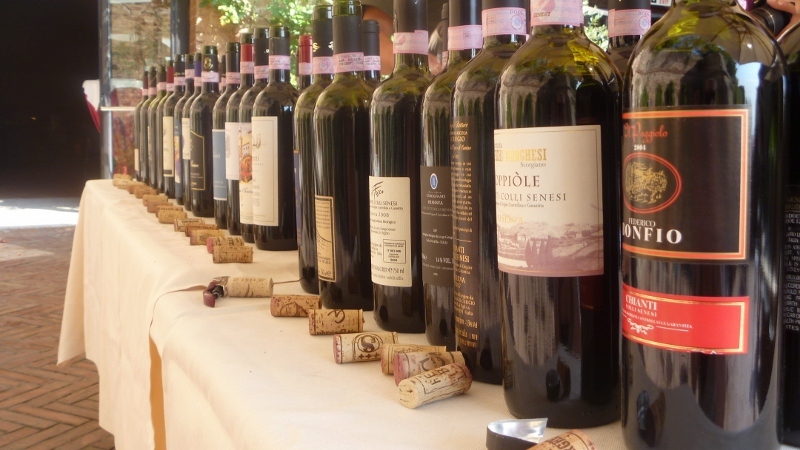 Carpineta Fontalpino (2010): As we moved to the second half of the tasting, the wines continued to get bolder and edgier. This one was also made with a more modern technique, allowing for regular temperature control, which you can tell from the purplish color around the ring (versus the tawny, brown tints from the others). It is full-bodied with cherry and blackberry notes. La Vigna Reserva (2006): This wine was made with cabernet sauvingon grapes, along with the traditional sangiovese. 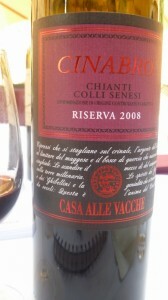 It is clean, with hints of pepper and chocolate and floral notes on the nose. 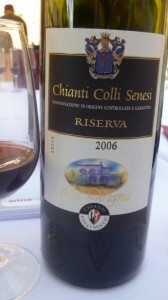 It also paired well with a wedge of salty, pecorino cheese! Cinabro Riserva (2008): Though this last wine in the tasting was the heaviest and densest, it is extremely approachable and drinkable.Clove and cinnamon were extremely prominent, with hints of vanilla. I think it would pair perfectly with a heavy meal, like a stew or pot roast. And that’s not where the fun ends… In fact, when the tasting was over, I don’t think it was even noon yet! Our next stop was Castel di Pugna. A bed and breakfast, as well as a working winery, this historical spot was incredible. 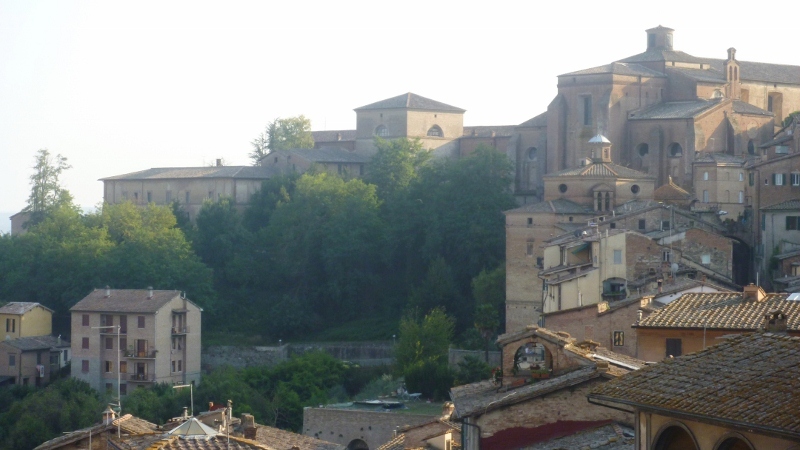 The view of Siena was breathtaking, as was the wine (Ellera, a ruby red spicy, yet fruity Chianti Colli Senesi; and Ellera Riserva, a fuller-bodied variety with intense spicy notes). They treated us to a three-course lunch that was lip-smacking. The meal started with a freshly baked Parmesan cheese “basket” holding the salad and an aged balsamic vinegar that I couldn’t get enough of. Next, they served slices of tender juicy pork and the most amazing roasted potatoes I’ve ever had. And we ended on a high note, a beautiful lemony-cake with a dark chocolate sauce that brought out the brightness of the cake. 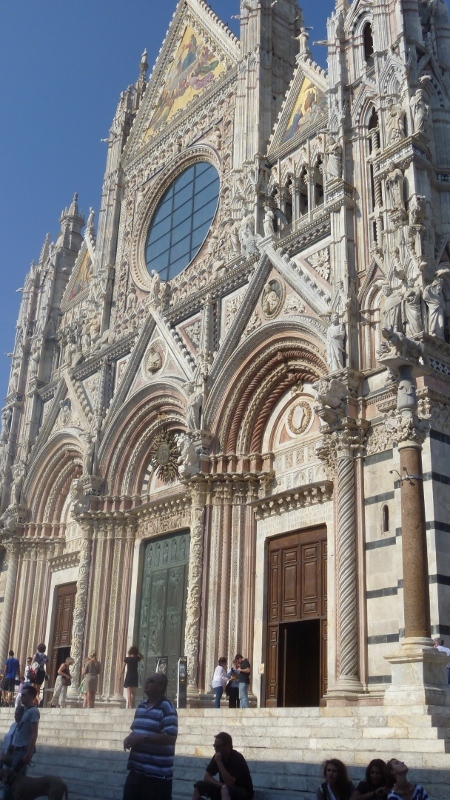 Next stop: A tour of the beautiful cathedral, Duomo di Siena and the Palazzo Pubblico. 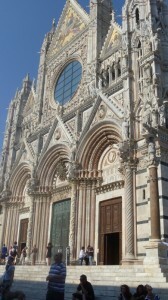 The cathedral was alive with intricate artwork from floor to ceiling. And the Palazzo Pubblico which serves as a kind of town hall has its own share of beautiful artwork, and amazing views from the top of the tower! To end the day, we had amazing four-course dinner at La Compagnia del Vinattieri. The meal began with a form of bruschetta that you built yourself. 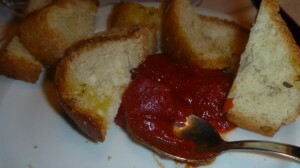 Instead of the traditional diced tomatoes and garlic, this version had a spicy tomato sauce to top the crunchy bread. 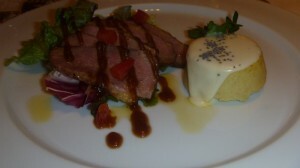 For the appetizer course, we had smoked duck with fennel flan. The flan was creamy, and savory with a subtle hint of licorice flavor from the fennel, which was enhanced by the smokiness from the duck. 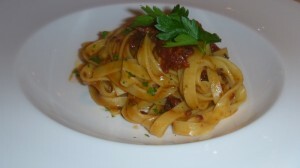 For the pasta course, we had handmade tagliatelle with sun-dried tomatoes and olives. This was my favorite course of the night! 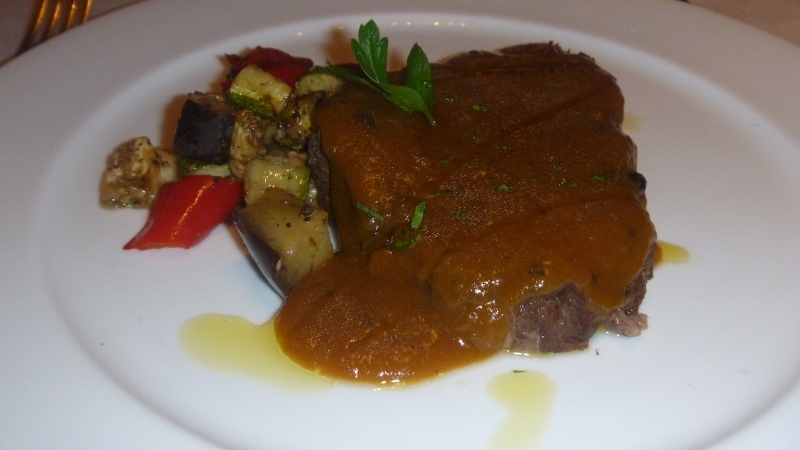 Next was braised beef with a Chianti Colli Senesi sauce, and a side of sauteed veggies. The beef, very similar to a pot roast, was so tender, it was literally falling off the fork. I contemplated licking the plate to finish the sauce, but decided to mind my manners! 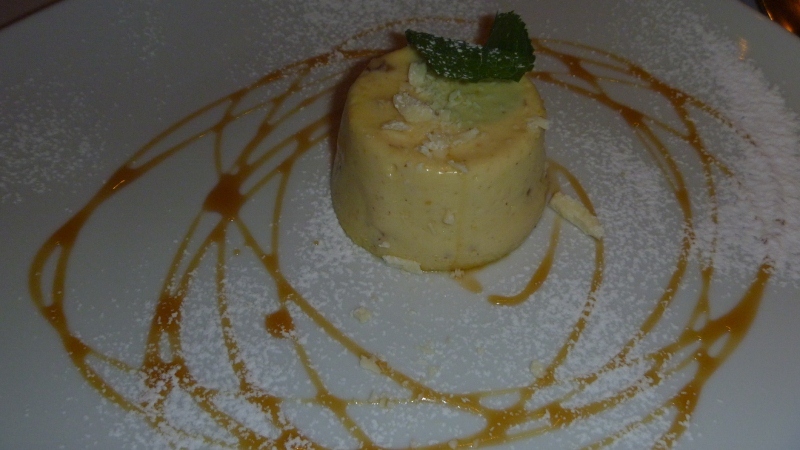 For dessert, we had panforte mousse. Panforte (translates to strong bread) is a traditional Tuscan cake that’s dense and made with nuts and honey. The mousse played off of these flavors and was a light, delicate end to a wonderful dinner. And of course, we couldn’t leave without a tour of the restaurants wine cellar, which was the complete opposite of the first wine cellar I saw today, but still had a certain “traditional” old world charm. Stay tuned for more adventures tomorrow! We are visiting 3 wineries – I’m really going to need to learn the spit technique! This entry was posted in Restaurant Review, Travel, Wine & Cheese. Bookmark the permalink. 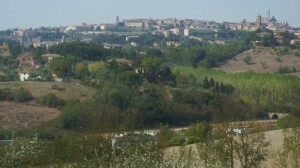 I hope to see once again in Tuscany, at Casale to taste some other of my pearls.